The catalogue for Solarize, curated by Jesse Leroy Smith, states that this is a show consisting of art inspired by the landscape: 'using a variety of contemporary processes to manipulate landscape imagery...the artists are bringing a tension between the natural and the synthetic'. Focusing exclusively on a consideration of the impact of new technologies on the representation, perception and experience of the natural world seems important, and is an excellent premise for an exhibition at this particular historical moment in Cornwall. If nothing else it offers the tantalising possibility of radical new take on a genre that, whilst often commercially appealing, all too often tends to look tired and clichéd. Three works by James Hankey set the tone (picture above bottom). Previously shown in Embark, Tales of the Unexpected, Revolver and Transition, Hankey's remarkable long-exposure photographs are taken at night and contain light trails made with a torch or burning paper across the landscapes of Cornwall and Southern England. Derived from a tradition of Land Art, with Richard Long the obvious precursor, Hankey is the only artist in the show that seeks to interact with the environment in a performative sense. His seductively beautiful works are essentially the record of an action in the landscape, and blur the boundary between artist and subject. Beth Copley's (below top) works contain a similarly sumptuous palate but their subject matter is more microscopic. 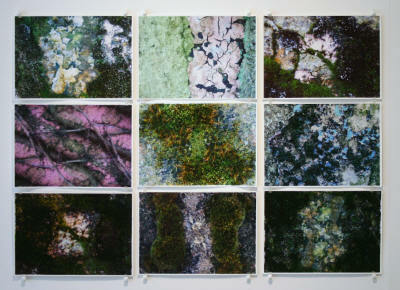 Consisting of close-up photos of moss, lichen and various weathered surfaces, we are enjoined by them, as Blake suggested, to 'see the world in a grain of sand'. Extracted from their context there is no sense of location, and therefore we are denied the political or historical dimension associated with a specificity of place, but the works are pleasing and in one of them subtle manipulation by photo-processing software creates interesting unnatural symmetries. Stacey Ebel's black and white photographs (above bottom) seem very contemporary despite, paradoxically, using an old technology, and this attention to the means of its making links her work to the others in the exhibition. Ebel uses a pinhole camera to take photographs in black and white. The exposure times are long - up to half an hour - and, like painting, there is plenty of scope for human error some of which serendipitously enters the work. Similar to Paul Nash's photographs from the 30s, there is usually just enough information in these rather nostalgic and melancholy images to very imply a narrative of sorts. Copper plate, as a support or base for oil paintings, has been around even longer than pinhole photography, having been used by Elizabethan painters like Nicholas Hilliard for painting miniatures, and famously by that most exemplary landscape painter: Caspar David Friedrich. 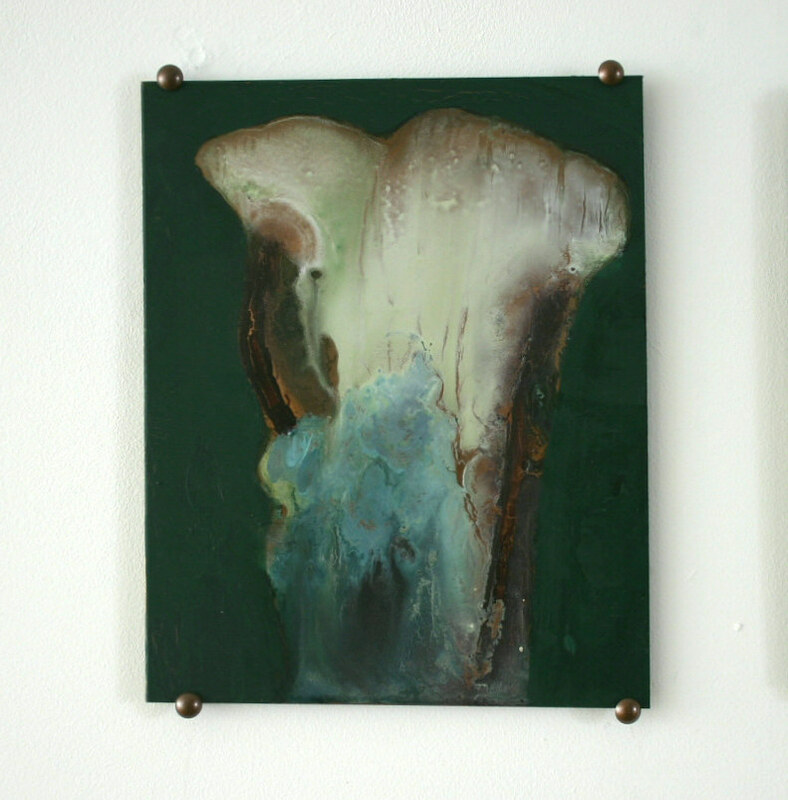 The small copper plates used for Jesse Leroy Smith's new paintings (picture above) impart on them a warm orange glow, like light in the late evening. There are more than ten works including a group that are paintings of flower heads, and others that are more fantastical, depicting what appear to be mysterious moonlit scenes. Although derived from photos, these works are still oil-paintings and in this company are a potent reminder of the appeal of this traditional medium. Richard Ballinger's drawings on canvas (picture above top), look like photographs but aren't. They are, however, derived from digitally manipulated photographs, and feature caravans and chalets meticulously hand-drawn in brightly coloured inks. Many are perched on cliffsides or hilltops and, with the camera turned in the opposite direction, the viewer is invited to imagine the landscape that they overlook. Holiday chalets as a subject are an astute way of referring to the economic uses that are made of landscape imagery - in this case selling Cornwall to tourists and holiday makers - but the yellow sky and acid colours in works like this one ('White Hut') alarmingly suggest nuclear holocaust or some other cataclysmic event. 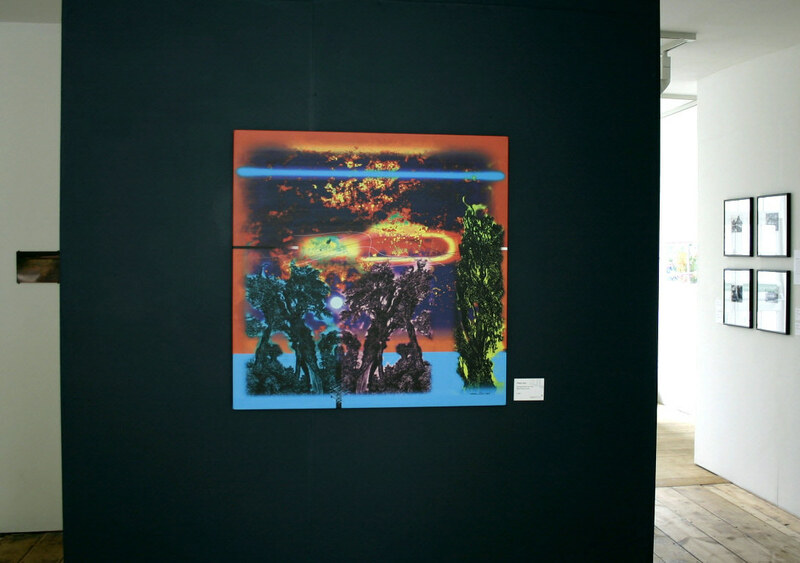 Volker Stox's unique prints are abstract images made on a computer. They had a Gilbert and George-like quality when shown as lightboxes in 'Revolver' in 2007, but are here shown as framed works on paper or stretched canvas (picture above bottom). They comprise dense digital collages of unnatural colours and natural textures, punctuated by elemental forms like circles, ovals and squares. In some ways they are like modernist art from Cornwall, being reminiscent of Barbara Hepworth's lithographs from the 60s and 70s, for example, or John Tunnard's surreal landscapes from the 30s (see artcornwall.org profiles). Like Hepworth there is also a link to the neolithic monuments of Penwith, such as the Men-a-tol, and, in reference to this, Stox refers in the catalogue to the ancient landscape near his studio. 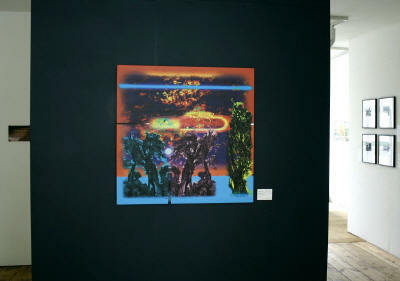 Simon Jaques contributes six works (picture above top), all of which are different in scale and effect, but which are united by a concern with the testing the limitations of new technologies. Jaques appears interested in allowing any manipulation of the image to occur without his explicit involvement, except in a conceptual sense through processes of miniaturisation or enlargement. The pine tree is a recurring motif, and one very low resolution image is shown blown up and pixellated as a framed print. In another work (above bottom) blurring caused by the motion of a car, is accentuated by enlarging the original polaroid image. Open Space Galleries in Penryn opened at the beginning of the dreary, wet Summer of 2008. Yet the main exhibition space, with windows at the back as well as the front, feels airy and light whatever the weather. There was a limited range of conceptual strategies on display in 'Solarized', but the narrowness of its concerns gave the show an unusual coherence, and it was refreshing to see a new approach to the landscape brought together in one space. Cornwall is unique in the UK, and quite possibly the world, in having such a large community of artists living together in what is actually a rural (and maritime) area. It is therefore important to recognise that, as they did in the last century, artists living and working in Cornwall should have something rather special and unique to contribute to the ongoing tradition of landscape art as it evolves in our own century.